This is one of the schools more popular take home meals that faculty and staff can purchase to take home and bake for dinner. That’s right it is assembled but not baked! 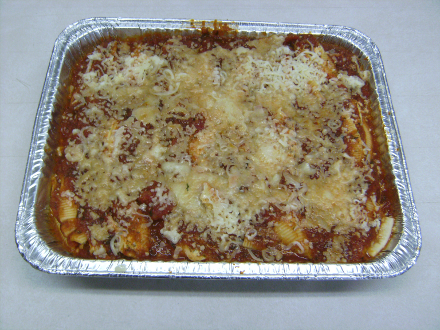 Stuffed Shells Take Home Meal Profits(Excel) – change this document to match your pricing and ingredient costs. Ingredient Tips: there are 5.5cups of ricotta in a 3lb(48oz) tub. There are 13 cups in a #10 can of spaghetti sauce. If your homemade sauce tastes burnt or bitter add some sugar. You can also have your baking class or the culinary class make garlic bread or focaccia bread as an accompaniment to the meal. Purchase and cook a few extra boxes of pasta because some shells will be really broken or shredded looking. If you’re in a pinch and need to use the broken shell pieces simply fill them first and put them in the bottom of the pan. Use nice, whole shells for the top layer. It is really easy to run out of ingredients if students don’t scrape the containers completely with a rubber scraper. I usually account for some error in measuring just to make sure we don’t run out of ingredients–sauce and ricotta specifically. Make your own spaghetti sauce from scratch! Add one day for making the sauce.